Inspired by the lovely Nadia over at Scandi Mummy I’ve written what I’ve decided are my 10 commandments. 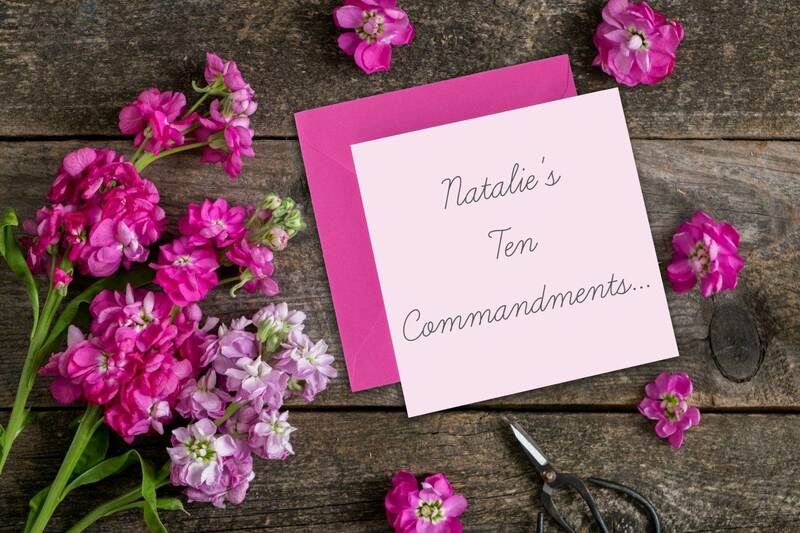 Not that I’ve ever lived by a set of commandments before, and my world isn’t going to fall through if I break one, these aren’t legally binding or anything – ha-ha. Life is chaotic sometimes and I really need to overall take a breather, assess things calmly and chill the fuc* out! Yep, I swore on my blog. I doubt you’ll ever see that again. 😉 There’s a first for everything though! If you know me or read my blog regularly you’ll know that I work a lot. I basically have four jobs (I’m totally okay with this) and that doesn’t even include my number one role as a parent to Coby. As much as I love my life, I really do, I am happy, it all gets on top of me sometimes and I love that having my blog and using it as a creative outlet and online diary kinda saves me some days. I can vent on here and write about my feelings, pour my soul out if I really wanted to. Sometimes I write a blog post and it will feel like a big ginormous weight has been lifted from my shoulders. This kind of goes hand-in-hand with learning to say no more often, prioritising what is going to work best and what will suit me more. I sometimes take on way to much, instantly regret it and then dread the actual run up to when I have to do it. That’s not cool. A much simpler life would mean working less and spending time doing more of what makes me smile, and less time doing the opposite. What I love more than anything sometimes is to spend time doing absolutely nothing! I want to take a lunch break where I’m not ramming my sandwich down my neck and would love to actually eat more slowly and actually enjoy that time more. This one is a biggie for me right now. Lets face it and be honest; our time is limited and far too short to be wasting it on unimportant or un-meaningful events. Working at any job just to make money is a waste of your life – right? Living to please others can be exhausting. Routinely killing time doing boring repetitive tasks is pointless. Wasting precious time on my phone staring at the screen must be dulling my brain? I need to reduce my ‘screen time’. I love to read, like really love to read. Surely reading a book is a much more worthwhile way of escapism than staring at a screen. This matters to me. I read a quote somewhere once that has stuck in my head since; “Life tends to reward people who take action and take responsibility.” I like it. I like it a lot. If you think of anyone you know that’s made it or is successful at what they do, what’s the one thing they have in common? It’s not the mistakes they’ve made or whether they’ve fallen along the way, it’s the fact they picked themselves up and they carried on. Mistakes make us who we are. I need to remember not everything is easy, mistakes will happen and that’s totally fine, it just means you’ve got to change your ultimate goal. Your ultimate destination. Don’t quit. I think its’ quite obvious no-one can physically and mentally just keep going without a break. I’m always going to have periods of intense work and I need to match that with equally as much downtime. Plus, I don’t know about you but I find that I achieve better results if I have a rest and a bit of time out. I love spending time with my family but I equally love time to myself too. Sometimes a change of environment can do wonders when you’re a bit distracted and agitated. Me time is important. Steve and I heard something this week about our current home. Something that happened before we lived there, it’s not nice and it’s actually really upset us both. We’ve been a tad unhappy there for a while, it’s not our ‘forever home’ and we’ve come to the decision together that it can’t carry on. I need to be in a place where I feel comfortable, a place we can all relax together but that functions for what we need. I love to travel and you may realise over time I’m a sucker for a fancy hotel but I love home. Home is me. Home is best. It needs fixing and this commandment is something that really needs some careful planning and thought. We can do it though, it’ll be fine. No, I’m not a bully, I’m actually talking about body shaming myself. Does anyone else do that thing where one day you feel amazing, your hair just does what it wants to do and your dress makes you look a little slimmer, then BAM, the next day you hate yourself and you’re possible feeling like the ugliest fattest person on the planet? I do and it’s actually only a recent thing too. Re-wind a few years and my size didn’t bother me in the slightest. Don’t get me wrong, I’m not obese, I’m actually very healthy and I really really need to remind myself of that more! This is my body, it is what it is and it;s amazing. Fact. I’ll admit it, I worry about money – who doesn’t! I like having security and I also know we’re in a good position and probably luckier than most. I need to remind myself that more money doesn’t buy us happiness, it doesn’t fix things and having more of it doesn’t necessarily make your life instantly better. Be happy with what you do have and remember ‘things and stuff’ don’t mean half as much as time and love. If you asked me what I wanted for Christmas a few years ago I’d have told you I wanted everything, nowadays, I’d rather spend time with my family or spend the money on an ‘experience’. Material possessions no longer matter to me as much as they once did. Don’t get me wrong, I”ll always love to shop, but I’d choose my family over possessions any day. Easier said than done I think. Stop stressing the small stuff. I often find myself saying: “is it really the end of the world” or “it’s really not a big deal“. Is it going to matter in a a minutes time, a week or even a year? If the answer is no, then it’s definitely not worth stressing over. It’s human nature to be annoyed (I used to be the world’s most impatient person) but ask yourself, is it really the end of the world if you’re five minutes late? It really doesn’t matter in the grand scheme of things does it. Sometimes it’s about putting life into perspective and realising that these little problems and stresses aren’t worth wasting time over. Big reminder to myself on this one. Aside from the obvious things like go to bed earlier, drink more water, eat your fruit and veg and all that I need to move more! I’ve always enjoyed certain exercises. Yoga was a passion for a few years and last year I developed a slight spinning addiction. This year – I’ve rarely exercised at all and I do miss it! Exercise is such a good stress buster and I remember fondly the memory of how it would make me feel afterwards. It massively helps to beat the stress and is great for endorphins. Even just going on a walk can help clear my mind. Steve keeps asking me to go and I’ve always got some sort of excuse of why I can’t – sorry Steve. Also, sleep is necessary. When I was younger, it was cool and fun to stay up as late as possible. Now? Now, I totally love my bed and constantly want to be sleeping in it. I look forward to it, I cherish it and nothing makes me happier than a good nights sleep. For a super organised person this one I am SO incredibly guilty of. I think, “Oh, I’ll have more time next month to do this or that.” Or, “I don’t feel great right now; I’ll work on that later” or even I’ll do it tomorrow” And so on. And that’s a great way to get nothing done. Ever. So – starting right now, I’m changing it. I’m going to make a goal, make a plan to achieve it, and then immediately start taking steps to complete it. Action creates results. Results make me happy. Do you have any life lessons like this? Have you learnt anything recently? "The Best Pizza in Reading"
For me it is ‘It’s never too late to learn’. At age 60, I started going to cake decorating classes and get a huge amount of pleasure putting these into practice. I reduced my golf handicap to under 30 for the first time ever at age 61 and I have recently started working with a personal trainer to get to grips with High Intensity Interval Training to improve my fitness. Self-development and learning new skills should be a life long process. Sue, you’re so wise! And way to go on the golf! OMG I love these! So many good ones here, and so simple to help you lead a more content life! Stop Sweating The Small Stuff and Start Now are something I most admire! A sleep would make so many things feel and look simpler the next morning and it is essential to look after ourselves to live the life to the fullest! These are all great ideas! Good ones to live by! All of them are great tips, thank you for the reminder. I think sometimes, if you want to do or try something, it’s best to really start now rather than later. Also, taking care of yourself is so important! This is such a good idea-love this! I would definitely add your first 2 to my own list. These are great commandments! If we follow even half of these, the world will become a better place! I literally just let out a big exhale. You are so right, we all need to relax and not stress over so many things! I would like to live by these, too! Body shaming is something that is currently doing my head in, how dare people talk about others in such a degrading way. Its not funny & SURELY it can’t make you feel good doing it. I will admit many a moon ago I used to do it but it makes me cringe that I did! Its embarrassing. Life is also way too short, since my nan passed away I’ve turned myself around. I’m more engaging with others, I try my best to support others as much as possible & I realised I just can’t waste my time with certain people. They are sucking away my goodness trying to replace it with their hatred.